In 1992, I took an excursion that changed the way I travel forever. Instead of spending another day moving between the lounge chairs at my Cancun hotel’s pool or beach, I took the Mayaland bus to Chichen Itza. At that time there was no highway, and the trip took over 3 hours each way, on the old road through Maya villages, each with at least 2 but usually 4 speed bumps. That day happened to coincide with a Maya holiday and over 2000 Maya people were at the ruins. They had apparently never seen African American people before, and the women in my group aroused a lot of curiosity – especially their braids. It was a cool cultural exchange that made an impact on me – as well as the majestic ruins that tourists could climb all over at that time. This experience set me off on a lifelong exploration of worldwide ruins – and I’ve seen a few. Here’s my list of the Top Ten – with additional nearby sights. Located near Siem Reap, Cambodia, this vast complex of major ruins sites can take days to visit, although many visitors cram a few of the major ruins sites in a day visit. Its showpiece, Angkor Wat, is considered the world’s largest religious building with spectacular carvings and it’s beautiful towers. Angkor Thom, pictured above (and in my standard profile photo), still features some of the growth of trees that kept it covered for years. You saw it in Laura Croft Tomb Raider. Bayon, the structures with the huge heads, and Banteay Srei are among the most visited temples, but there are many many more of various states of restoration. Some of the more remote locations give visitors the feeling of being in an Indian Jones movie, as you climb over the huge blocks of unrestored temples. This crowning achievement of Inca building prowess is not easily reached, and I recommend spending at least 2 days to fully explore the site. There is a Belmond (soon to be rebranded by LVMH) hotel near the ruins, but most visitors stay a bus-ride away in the town of Aquas Calientas. You can also hike the Inca Trail to Machu Picchu – with varying degrees of food, accommodations, and porter support. Theories abound about the origins; I believe the one that this was a resort for Inca rulers. While you’re in the area, there are other major ruins, and areas to visit. The Pisac ruins and market, Cusco, and the town of Ollantaytambo with it’s ruins would be built into any itinerary I design. Easily visited as a day trip from Cancun, Tulum, Playa del Carmen or other area resorts, this new 7th Wonder of the World is well worth missing a beach day if you’re in the area for more than a long weekend. Even though visitors can no longer climb El Castillo, the tallest pyramid, the ruins are well worth visiting. The observatory, ball court, and other structures have been well restored and a good guide can explain what you’re seeing. Don’t miss the Sacred cenote, which is a pilgrimage site for local Maya descendants. If you’re in the area for the Spring or Fall equinoxes, supposedly the Maya built El Castillo so that the sun hitting the structure resembles a snake climbing up the side. I haven’t seen this myself. It’s a great idea to stay overnight at Mayaland Hotel to be at the ruins in the morning before the buses roll in from the resort areas. There is a light show at the ruins at night. Other nearby Maya ruins worth visiting are Tulum and Coba, the less visited Ek Balam. The tallest pyramid at Coba can still be climbed, as far as I know. Those with a deeper interest in the Maya may want to visit the smaller Pu’uc Route ruins and Uxmal as well. Uxmal also has a light show that is a little corny but beautiful, plus a great hotel just outside the entrance. This area is also features multiple spectacular haciendas to visit, many of which have been converted to boutique hotels with excellent food. Some offer yoga and cooking classes. Each time I visit Tikal more of it has been excavated. The area is enormous and more and more of it is being uncovered all the time. It turns out an archeologist who happens to be an assistant professor of anthropology at my alma mater, Ithaca College, recently discovered concealed remains extending well beyond the zone previously determined to be Tikal’s borders with laser light detection and ranging – or LiDAR – mapping. Tikal features several high temple structures that can be climbed, and many other temples and edifices to view. It can be visited in a day from Belizean jungle lodges, but it’s better to stay nearby or at one of the hotels in the national park. Everything from backpacker hotels to luxury lodges exist. Sunset from the top of Temple IV should not be missed, although others prefer sunrise. If you’ve never heard a howler monkey scream, the first time can be disconcerting! Families of spider monkeys can be seen everywhere, and it’s a birdwatcher’s paradise. Even the quetzal can be spotted. For those in fantastic shape who like to camp in the jungle, there are organized multi-day treks from Tikal to nearby El Zotz, which is in the process of being excavated and restored. If you’re visiting Malta, don’t miss this! It needs to be reserved well in advance because only 10 people per hour are guided to the underground burial site 8 times per day. Three levels of rock hewn chambers date back to 4000 BC. Ticket sell out fast and no one under 6 is admitted. I am mildly claustrophobic and didn’t suffer at all in the ruins. It is warm but not hot and stuffy like the Scavi in Rome. Malta has other outdoor ruins site like Tarxien, Ta Hagrat temples, and Hagar Qim. There are also Roman ruins with beautiful murals in Rabat. These majestic ruins are a short trip from Mexico City. Although I went by public bus, an organized tour is a better way to go and I can easily arrange one for you. The site is huge with many up and down staircases to get from plaza to plaza, so its not for the mobility challenged. Some of the temples still have the red paint that coated most of the buildings. Make sure to check out the sides of the Temple of the Feathered Serpent, as you can see ornate sculptures of snake faces and bodies covering its surface. The pyramids of the Moon and Sun are the tallest structures – and easier to climb than the steep steps of Mayan ruins. This major Mesoamerican city had a population estimated to be over 125,000 in its heyday. Although often called an Aztec site, Teotihuacan is pre-Aztec, and historians are unsure exactly who lived here and built it. Definitely worth the trip from Mexico City. These Roman ruins on the way to Meknes are included in any Morocco itinerary I provide. Originally Berber, Volubilis became the capital of Mauritania before being ruled by the Romans. Beautiful columns and Roman mosaics can be found here. There’s even a triumphant arch. 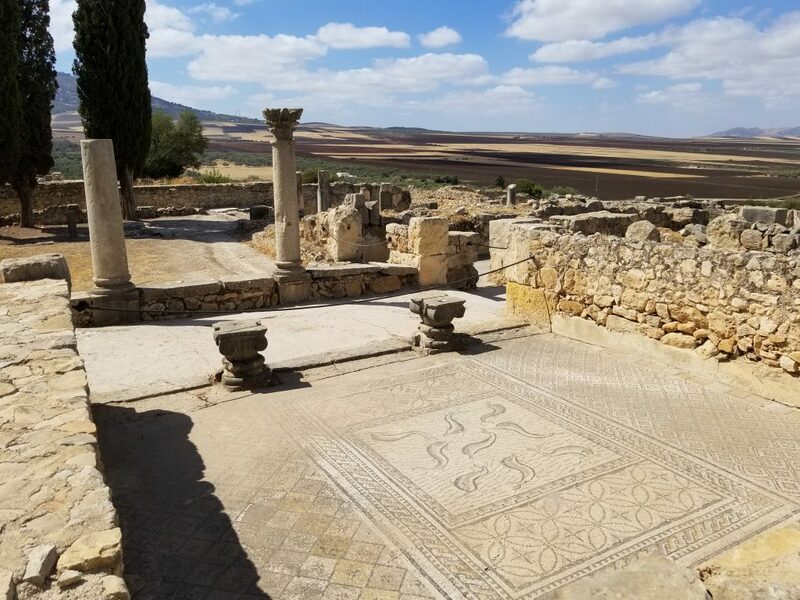 Excavated and restored by the French, Volubilis is now a UNESCO World Heritage site. Best visited from Belize’s jungle lodges, Caracol is for serious Maya or ruins enthusiasts. Depending where you’re traveling from, the trip can be arduous with bad, bumpy roads. Once you get there, you will feel like you have these ruins to yourself because they get very few visitors. Caracol has over 35,000 buildings. Most notable of these is Caana, the sky tower, which can be climbed to view the grandeur below. Don’t expect guides to always be available at the entrance; you might want to take an organized tour from San Ignacio, or your jungle lodge. Also in Belize are the fantastic Maya ruins of Xunantunich, Lamanai, and Altun Ha. Altun Ha is close to Belize City, and often offered as a cruise ship excursion. The trip to Lamanai includes a scenic boat trip and is highly recommended by me. Speaking of harder to get to, Palenque is best reached via the airport in Villahermosa, which is a 1 hour non-stop flight from Cancun and about 2 hours from the ruins. There are also flights from Mexico City to Palenque’s air strip with several domestic carriers with good reputations. You can also drive or take a bus from Merida, or San Cristobal de las Casas. This mid-sized ruin site in Chiapas is known for its ornate details, roof combs, and hieroglyphics. Dating from 226 BC to 799 AD, only a small percentage of the site has been excavated. Combine a trip to Palenque with San Cristobal and the nearby smaller Maya ruins sites of Bonampak and Yaxchilan, which is reached by boat. There are several ways to get to Calakmul – all of them lengthy. Adventurous travelers will probably want to rent a car and go independently, but there are day tours from Xpujil, Palenque (5 hours each way), Bacalar, Chetumal, and Campeche. The best way is probably via Xpujil or Chetumal. The road in the biosphere is now paved, making it a faster, safer journey. The closest town is Xpujil, with hotels, restaurants, tour operators, and drivers to get to the biosphere and ruins. Only 15,000 people visit these ruins per year so the jungle animals are comfortable with humans. Over 6,750 structures have been identified so far. Structure 2 is over 148 feet high, making it the one of the tallest Maya pyramids. Many jade and artifacts from the tombs are found in the Museo Arqueologico at the Fort de San Miguel in Campeche. If you don’t want to make the trek to the ruins site, I highly recommend this museum. Another notable Maya site. Located in Honduras close to the Guatemala border, these ruins are better visited from the later. Van service is offered from Antigua and bus service from Guatemala City. There used to be a way to go from Tegucigalpa in Honduras, but I would avoid that now. Copan is the most ornate of the Maya ruins with well preserved or restored alters, shrines, carvings and statues know as stelae. There are so many stelae, they are indicated by numbers and letters. One of the best preserved temples, the Rosalila, showcases the bright colors that all the ruins used to feature. Best to check the safety conditions before traveling to Copan because the situation can be fluid. Egypt is once again seeing many visitors, including Americans. The major pyramids and Sphinx might not be considered ruins, but I’ve included them because there are a few pyramids at Giza that are in more ruin-like condition. Plus there are ruins at Memphis and Saccara. It’s amazing when you realize how close these ruins are to the city – not in a remote location. Several hotels are just outside the entrance to the pyramids. The world renowned yet hot, stuffy Egyptian Museum will soon be moving to a large, air conditioned building closer to the pyramids. Beautiful Coptic churches in Old Cairo are pilgrimage sites for Christians who believe the holy family hid out in the basement of one of them after fleeing Jerusalem. The shopping is great in Old Cairo too. I moved the Pyramids and Sphinx from my Easy Access ruins due to the attack targeting tourists on December 28. Hopefully this was an isolated incident, but who knows? Egypt may have to go back on my book with warnings and cautions – or not at all list.